homemade almond butter. homemade turkey (or chicken) stock. chickpea dip. homemade roasted almond milk. vegetable stock. cilantro oil. organic apple rings. everything dressing. honey spiced almond milk. kale salad with citrus vinaigrette. homemade chocolate peanut butter "larabars". peanut butter, from scratch. mixed veggie mélange with lime dressing. vegan chocolate milk. salsa fresca marinade. homemade salsa for two. Now that the holidays are officially behind us, we can get back on track and start eating healthier! I don't know about you, but I am really ready to get back on the healthy eating road. Especially with the end of my pregnancy nearing- I just feel like I really need to start fueling up on all things good for me and packed full of nutrients! I'm about to run the longest and hardest marathon of my life in a few weeks! 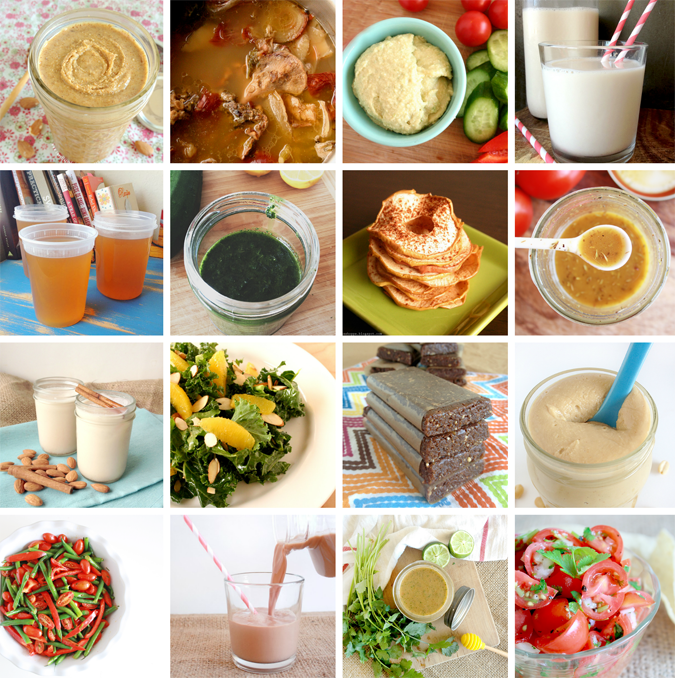 Here are 16 "good for you" or at least "better for you" recipes my family loves! SO many tasty looking options! Hehehe, hope you find one you like!